This week, alert reader and beloved fellow Shashizen Temple and I have been discussing which of the following images from the vast, impressive collection of Karen is the most...shall we say "unfortunate." In honor of Temple, a mild beverage warning is issued (that is, if you're drinking something, put it down before proceeding, just to be on the safe side). 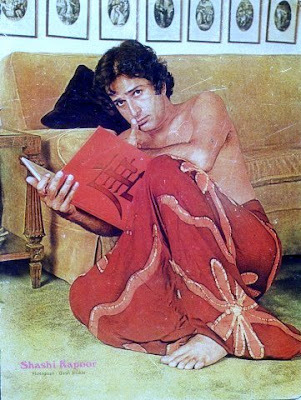 These are not the most outrageous 70s publicity photos you'll find in Karen's awesome stash - so far, I'd give that award to this one - but they are amusingly outside the Shashi Kapoor versions of refined gentleman/charming bourgeois smoothie/upright cop or army officer/nawab/lovable bumpkin we tend to see in films. Just too, too cheesecake for words. Stylistically acceptable for Ranjeet, perhaps, but not for Shashi. So many questions: What is that book about and why is it a thing that makes him go hmmmm? Is that the hand-on-mouth gesture you make when you're going hmmm? Is that a casting couch? Why the batik bottoms? Don't you wish they had put this outfit in the previous setting (if indeed this outfit was necessary at all)? Temple says: "The beery poolside one is far worse - I'm not sure I have the words in place to articulate my instincts but it is just...worse." I responded: "This [last] one is at least fake-pretend far-eastern Orient...um...I was going to say 'chic,' but I'm not sure that's applicable. Note that the pictures on the wall are not even lined up right. Also, whose house is this? HIS house? Why the batik sarong? Why the book? Why the thumb just so? SO FREAK. I agree, the beery one is worse, partly because we know what alcohol did to him later in life, but mostly because it could just as easily be Eric Estrada, and Shashi and Eric Estrada should NOT BE INTERCHANGEABLE EVER." What say you, readers? Which glamor shot should be the last one to be ordered in wallet size for all his friends? Update (October 14, 2009)! I can't believe I forgot this one! In my opinion, this is by far the least cheezoid - clothing is both present and normal - but it's still so...hey baby. Perhaps it's stage 0 of the semi-scandalous sequence of which the batik sarong photo is stage 5.
oh no! The beery leery muffin top with coiffed chest hair and eyes that follow you around the room is still freaking me out. But the so-wrong is indeed awful. I have a theory that the book is a "how to" pictorial of, erm, some sort and he is sizing the viewer up for the possibility of page 13...At least the fabric is arranged for some show of decency. But we have to remember this is the man who spent most of Satyam Shivam Sundaram prancing around shirtless - under a waterfall. The top pic, for certain. Apparently he sat a little too long poolside after consuming the entire contents of that bottle. And then he put on a groomsman suit. OMG, the shirtless poolside pic is definitely terrible on all sorts of levels but the top pic is all kind of date-rapey. WHAT is that bow tie all about? And the HAIR!!! 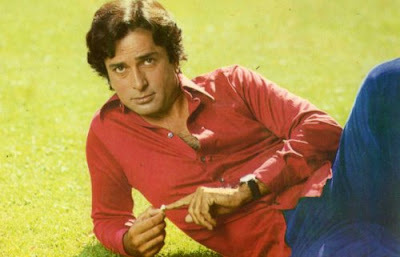 Dear Shashi, pls jump in time machine and stop. XOXO. I kinda like the last pic, mainly because of that...thing wrapped around his waist. I wouldn't mind a wallet-sized pic of the first image, actually. It's bad, but in an endearingly cheesy way. Hmm, I would have to go for the last picture but for completely Shashi-unrelated reasons. The non-aligned pictures remind me of our canteen at work which features the same element of interior decoration, alas usually without good-looking men, not even one's wearing sarongs. I'm in horror of the first picture! His bow tie and very Welk-esque though I dont mind the hair coz my monstrous mane does that too, the other two are strangely cute! The beery leery picture is just priceless I dont care if he looking blobby I think its pretty HAWT! This picture must be from the late 60's or the early 70's, because the lungi (aka sarong) was a popular item then! Methinks I too owned one in those days - it was unisex! I had one friend in college in those days who was mad over Shashi, and I seriously think you must be that friend's daughter or something - you share the same Shashi genes! Sarong pic takes my vote if only for the weird gesture and the look he gave. I didn't think the beer one was that bad until I read the burp comment!!!! 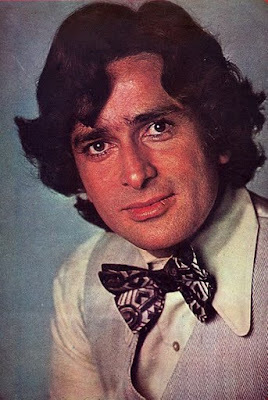 I wonder if Shashi hated those pictures. I would like to know if they got his approval before being published. I love him anyway, because even if there are many unflattering ones, there are as many good ones. Good post, thanks Beth. Hi Beth, I'm a fan of your blog :) It's amazing! LOVE all the commentary! I'm going to wait a bit more then tally the votes. In the meantime, I am delighted to learn about designer lungi - I had no idea! Elsa - Ummm.... Hmmm. Well, off the top of my head, there's certainly Zeenat in Satyam Shivam Sundaram. I'll keep thinking! The poolside pic is your memsaab! Okay I changed my mind then changed it back again. So I am still voting poolside but the sarong is a close second. However poolside still takes the cake. Looking forward to the poll results here! Haha. The Lawrence Welk banjo pic is too adorable.